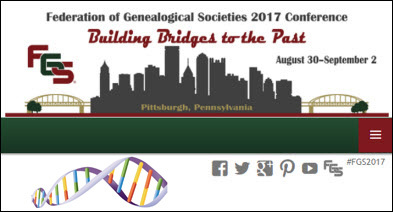 It’s conference time again, and hundreds of genealogists are already on their way to or happily ensconced in Pittsburgh for the 2017 conference of the Federation of Genealogical Societies. There are events today for librarians, and Society Day is tomorrow, plus there’s an evening river cruise as a kickoff social event tomorrow night. So… what kinds of goodies can we expect in Pittsburgh? Well, yesterday, The Legal Genealogist went through some favorite topics (law, genealogical ethics, and cool record sets we wouldn’t have but for the law). But there’s one more favorite topic, isn’t there? Yes, there will be plenty to choose from if what you want to know about is DNA testing and how to use DNA evidence in genealogy. 11:00 AM, T-206, Getting Started with DNA, presented by Janice Lovelace Ph.D.
Autosomal, mitochondrial, Y-DNA— what do these terms mean and where do you start? This session focuses on the basics of genetic genealogy as it takes a beginning look at DNA testing for the genealogist. In this lecture we will discuss various methods for keeping track of your DNA matches—especially your autosomal DNA matches. We will first discuss what kind of information you need to keep track of, and why. We will cover the basics of Excel, Word, and e-mail. We will talk about tools like Evernote and Transpose that can help you standardize your organization. This lecture will leave you armed and dangerous, ready to identify your best autosomal DNA matches and begin to move forward with the real genealogy business of making connections. Together we will examine some of the advanced tools from GEDmatch, DNAGedcom, and others. We will also examine some of the new third-party tools that have launched in the past year or so. • 8:00 a.m.-noon, F-344, workshop ($): Connecting the DNA Dots, presented by Blaine Bettinger PhD, JD, Angie Bush MS, and Diahan Southard. • 8:00 a.m.-noon, S-446, workshop ($): Using Genetics and Genealogy to Smash Through Brick Walls, presented by Blaine Bettinger PhD, JD, and Angie Bush MS.
Do you want to learn more about what you can do with your DNA matches? Get tips and tricks on how DNA matching works and how you can leverage the tools at AncestryDNA to answer your genealogy questions. Learn about how DNA works, what’s new at AncestryDNA, and how to get the most out of your DNA matches. We’ll provide an overview of AncestryDNA and how it can help validate your research and find new leads. Anyone with an autosomal DNA test likely has a long list of potential relatives. But how do you make the most of those matches? Which matches are worth your time and effort? Learn to use genetic and genealogical clues to filter and sort your matches to make the most progress with your test results. Ask DNA experts your questions about DNA testing for genealogy. What does the future hold? What ethical and legal issues should be considered when DNA testing? What tests, tools, and tricks do these experts use that may help in your research? Using a case study, learn how Y-DNA and autosomal DNA testing helped one family to better understand their own past and gave them incentive to reach out and connect with others. We will cover methodology and the sociology of this kind of situation and best practices for you and your family as you strive to forge bonds with others in a non-traditional way.